The Comprehensive Materials Testing System contains everything in the Materials Testing System and much more. 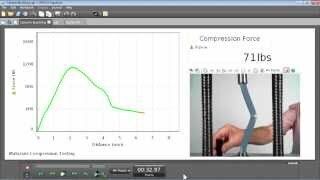 Integrated system for tensile testing, measures both force and position. Includes coupons, AirLink interface and Capstone software. Includes everything that comes with the Materials Testing System as well as several additional accessories and a storage base to house components when not in use. This is the assembly-only version of the Materials Testing System. Coupons, interface and software are not included. 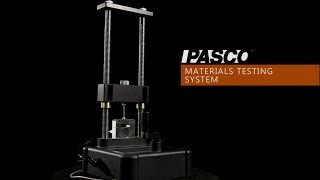 The PASCO Materials Testing System includes everything needed to do tensile testing straight out of the box. 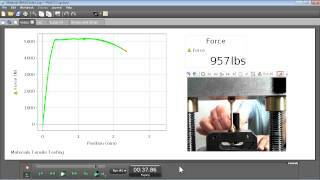 It measures force with a 7100 N load cell and displacement using an optical encoder. The Materials Testing Machine connects to a computer's USB port using the included PASCO USB Link. Six sets of different tensile sample materials (each with 10 samples) are included. The Comprehensive Materials Testing System includes everything needed to study material testing. 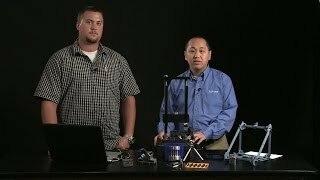 In addition to everything included with the Materials Testing System, the Comprehensive system includes a sturdy plastic base which provides convenient storage for all the components as well as the accessories that allow your students to investigate compression and tensile testing, column buckling, three and four-point bending, shear testing, stress lines with photoelasticity. See below for the full list of components. PASCO Capstone software allows students to view the data being collected in real time and provides all the tools needed to analyze the data afterwards. 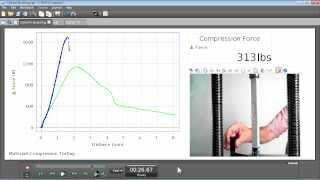 Both systems are completed by PASCO's Capstone Software, which has a built-in calibration wizard and all the tools to record and display stress vs. strain, and to apply linear fits to find Young's Modulus. Also records and plays back webcam movies of the breaking samples, synced to the data. PASCO Capstone Workbooks include set-up instructions, theory, and detailed analysis questions. The software uses automatic variable oversampling, which means when the sampling rate is high, no smoothing is applied, but as the sampling rate is decreased, the program automatically samples at the higher rate and averages the samples. Also available is the Materials Testing Machine which is the Materials Testing System without the Tensile samples, interface or PASCO Capstone software. The graph shows shearing of steel, brass and aluminum rods, all having an 1/8" diameter. The shear strength of each material is measured. The Materials Testing System labs are available as a single download. Each zipped experiment folder contains a .pdf lab setup file and a PASCO Capstone data file. 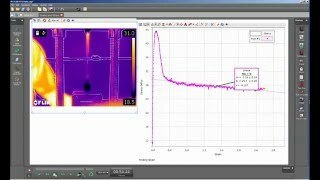 Important Note: The Materials Testing Systems require an interface and PASCO Capstone software for use. An AirLink Interface and Single User License of Capstone are included with the ME-8244 Comprehensive Materials Testing System and the ME-8230 Materials Testing System. But for the ME-8236 Materials Testing Machine you will need to add an interface and software license. Our most economical interface. Connect a single PASPORT sensor to your Mac or Windows computer, Chromebook, iPad, iPhone, Android tablet or smartphone via Bluetooth 4 or through a USB connection. All of these components are included as part of the Comprehensive System but are also available for purchase individually to expand your Materials Testing System or as replacements for the Comprehensive System. Add the USB Camera Microscope to zoom in on materials and to document their appearance before and after an experiment. Dual-function Camera Microscope with USB connection. You can purchase additional or replacement tensile samples separately. Set of 10 Aluminum tensile samples designed for use with the Materials Testing System. Set of 10 brass tensile samples designed for use with the Materials Testing System. Set of 10 annealed steel tensile samples designed for use with the Materials Testing System. Set of 10 acrylic tensile samples designed for use with the Materials Testing System. Set of 10 polyethylene tensile samples designed for use with the Materials Testing System. Set of 10 steel tensile samples designed for use with the Materials Testing System.